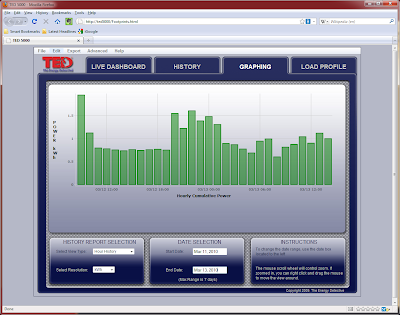 Shades of Black: Home electricity monitoring with TED 5000 and Google PowerMeter. 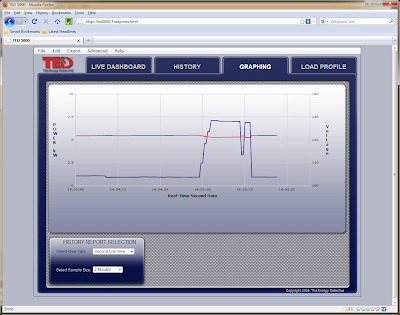 Home electricity monitoring with TED 5000 and Google PowerMeter. Being a tech geek who also hugs a few trees in his spare time, it's expected that I would be interested in a home electricity monitoring system. Throw in a Google application for this, and I'm naturally going to be all over it. 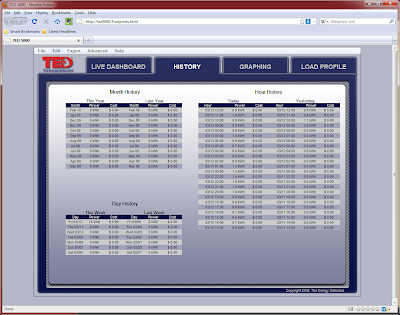 I recently acquired the TED 5000C from The Energy Detectives, which has support for Google PowerMeter. The system works by hooking up a monitor in my circuit breaker box. This transmits usage data via the electric wires in my house to a gateway that is simply plugged into any outlet. The gateway is connected via Ethernet to my wireless router, so my computer can access it via web interface. The web interface provides up-to-the-second real-time monitoring of my energy consumption, as well as the ability to see how much that energy costs (though I have not yet set up the pricing portion of it). After the electrician installed the monitor in my circuit box, we tested the system out by cranking up the oven and stove, and the blue power line on the graph shot up instantly. I recreated this for the second-live graph below. The gateway also sends data to Google Powermeter, which provides an iGoogle gadget that can be used to monitor my home power consumption from anywhere on the web. 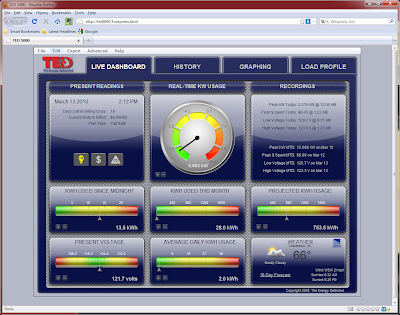 The 5000C model also includes a desktop display unit that shows usage statistics. The monitor is actually pretty easy to install. In retrospect, I could have probably done it myself in a couple of hours, but it was easier to have a professional who knew what he was doing. If you're familiar with electric wiring, you could have it all hooked up in under an hour pretty easily. So, what's the point of this exercise? I'm not completely sure yet. One of the selling points is that through monitoring you can more easily see the ways in which you could save on your electric bill. But I'm mostly in it for the cool factor. Ameren recently sent me a statement documenting my month by month electrical usage for the past 2 years, along with temperature data for each month. It was so cool, I almost had it framed. This might be even better though. Yeah, I received one of those too. Kudos to Ameren for doing that. Overall, I'd say I am more than satisfied with their service. Also, if you want to see my daily electricity usage at my house, let me know and I'll share the iGoogle gadget with you. One reason I'm a "belligerent" atheist. Welcome to "Shades of Black".